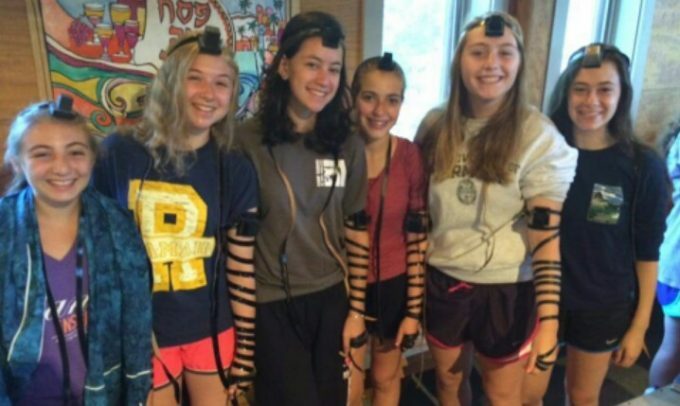 During kayitz 2016, Camp Ramah in New England took a number of steps to empower chanichot (female campers) and madrichot (female counselors) to try to do the positive mitzvah of tefillin in a pressure-free environment. With the help of donors and synagogues, Camp Ramah gathered over fifty pairs of tefillin so that all chanichot on Tzad Bet (B-side) would have an opportunity to try them. In Machon (rising 10th graders) and Nivonim (rising 11th graders), interested chanichot learned about the mitzvah of tefillin, including the meaning behind the mitzvah, how to wrap the tefillin, and the berachot (blessings) that accompany this process. According to Lauren D., the tefillin“made me feel more connected, more Jewish.” Rachel C. agreed: “It felt like HaShem was giving me a hug. This experience is a good example of how camp pushes us to try new things and be our own best selves.” When she puts on tefillin, Sarah R. “feels a special connection to something Jews have done for thousands of years.” Adira B., who has worn tefillin since her Bat Mitzvah “partially as an equality thing” and because it “helps you be in the moment” at tefilot, was happy that others had tried tefillin; she feels that more girls will wear tefillin more often if they have more opportunities to try it. “Camp Ramah is living laboratory of Judaism,” Rabbi Gelb emphasized. “By making tefillin available for the chanichot and by providing them with varied opportunities to put on tefillin, we want to encourage chanichot to try a new Jewish observance. Perhaps, at the same time, it may make some of the boys think differently about the mitzvah of tefillin.” We look forward to providing the chanichot with more opportunities to try tefillin and perhaps add this to their own set of personal practices. Todah rabbah to those who made this initiative possible: to Elie Abemayor, Rabbi Ariella Rosen and Congregation Kehillath Israel of Brookline, MA, who donated funds to purchase tefillin; Beth El of Bethesda, MD, which donated tefillin; and the following congregations, which lent their tefillin: Temple Emanuel of Newton, MA, Temple Israel of Sharon, MA, B’nai Israel of Rockville, MD, Temple Israel of Natick, MA, and Temple Emunah of Lexington, MA.